Blurb Description: From #1 New York Times bestselling author Marie Lu - when a game called Warcross takes the world by storm, one girl hacks her way into its dangerous depths. For the millions who log in every day, Warcross isn't just a game - it's a way of life. Struggling to make ends meet, teenage hacker Emika Chen works as a bounty hunter, tracking down players who bet on the game illegally. Needing to make some quick cash, Emika takes a risk and hacks into the opening game of the international Warcross Championships - only to accidentally glitch herself into the action and become an overnight sensation. Convinced she's going to be arrested, Emika is shocked when she gets a call from the game's creator, the elusive young billionaire Hideo Tanaka, with an irresistible offer. He needs a spy on the inside of this year's tournament in order to uncover a security problem . . . and he wants Emika for the job. Emika's whisked off to Tokyo and thrust into a world of fame and fortune that she's only dreamed of. But soon her investigation uncovers a sinister plot, with major consequences for the entire Warcross empire. I put this book down about half an hour ago and HOLY CRAP. I honestly do not know what to do with myself anymore because while I thought Warcross would be good, I didn’t KNOW THAT IT WOULD BE THIS GOOD? Also, that ending took the WIND out of me and I ACTUALLY let out a scream (nobody was around to hear me, so I’ll just post it on the internet for everyone to publicly judge me) and I cannot EXPLAIN how much I need the sequel right now. I simply have to get my thoughts out on this review, regardless if they make sense or not, so prepare for a lot of capital letters and fangirling down below. 2. THE WORLD BUILDING (especially the Virtual Reality World Building) is INSANE. HOW DO YOU COME UP WITH WORLDS LIKE THIS, MARIE LU? The technology, the arenas, the power-ups, the dark world inside the world – ALL OF IT WAS shockingly good and kept my brain spinning in marvel. 3. I LOVED Emika Chen. I loved her independent streak, her fighter attitude, her genius brain and her inability to back down. She was one of the best characters I’ve met this year and I AM SO EXCITED TO DO IT AGAIN in book two! 4. I loved Hideo Tanaka as well. He was quiet, withdrawn, OBVIOUSLY a genius and I LOVED HIM AND EMIKA TOGETHER. Also, the story of his past broke my heart into tiny little pieces. 6. Can I also talk about how stunning Warcross (the actual game) was? More, specifically, I LOVED the championships and everything to do with them. From the dome fights, the insane worlds that teams had to battle it out in and even the structure of each team – Captain, Architect, Fighter, Thief and Shield. Which brings me to HOW MUCH I LOVED The Phoenix Riders and the way they trained and their camaraderie! I only wish we had MORE of them and of the actual game! 7. I think the ONLY THING I didn’t like (much) about the book was that I pretty much predicted one of the MAJOR plot twists and made it not so shocking – but I was SO WRONG about the rest of it, AND IT AMAZED ME. All in all, this book is so SO worthy of every amount of praise that’s been thrown at it. 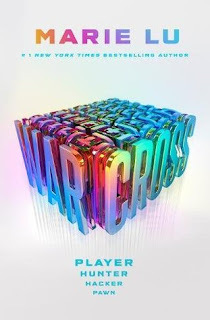 Warcross is spectacular, adrenaline filled, mind twisting and I LOVED EVERY SECOND OF IT. 5 stars. Have you had the pleasure of reading Warcross? What did you think of it? Are you a gamer? What do you play and on what console? Have you read Marie Lu's other books? Which series is your favourite and ~ ARE YOU EXCITED for Batman: Nightwalker?